B. 19 Oct 1687 at Kettle Parish, Fife Ref. D. 3 Jun 1739 at Ref. 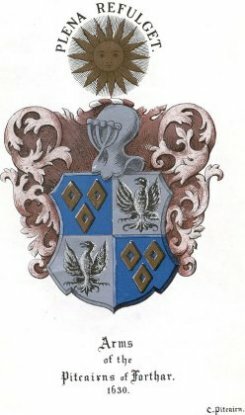 David Pitcairn, eldest son of Alexander Pitcairn, succeeded his father in the Barony of Forthar. David married Agnes Douglas, daughter of Sir Robert Douglas of Ardit and Glenbervie. Her brother, Sir Robert Douglas, who wrote the `Peerage,` and succeeded to the title as sixth baronet on the death of his half-brother Sir William. David Pitcairn of Forthar had only one son, James who succeeded him and eight daughters.